Today, we have rolled out a new way for you to share your outdoor adventures with friends and family. 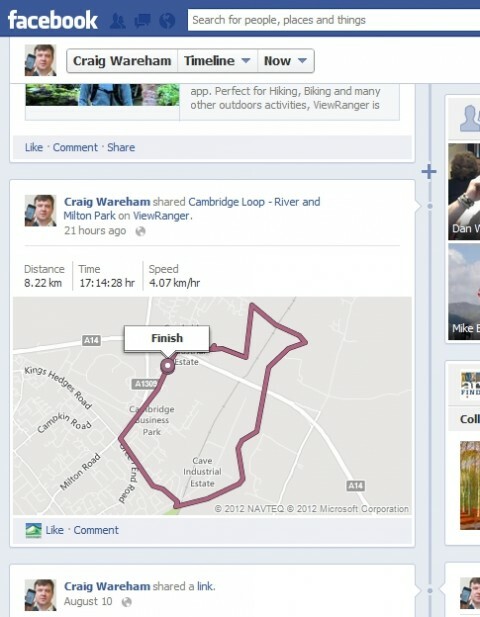 You can now connect ViewRanger to your Facebook Timeline, making it easier to share trail routes that you publish, along with gps tracks and Trip Stories that you record. 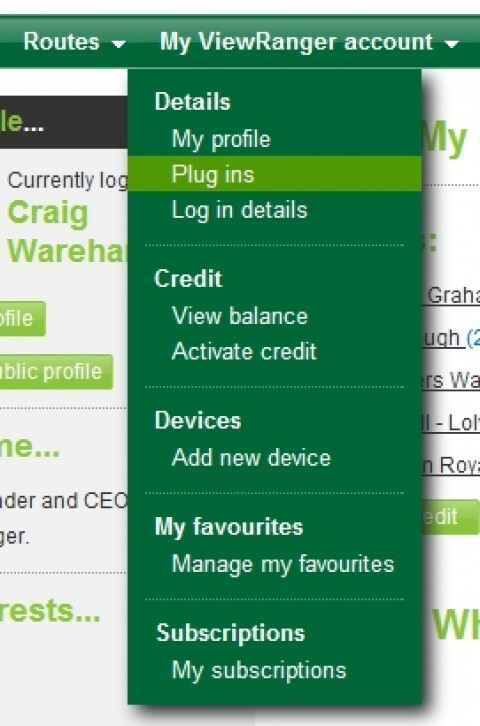 Following on from the release of social screens, including the new Trip Story screens, within the ViewRanger app (see this blog post) which make it simpler to share your outdoor adventures with other ViewRanger users, we also want to make it easier for you to share your outdoors passion with other friends and family. Connecting ViewRanger to Facebook Timeline lets you do this. Now that you can log-in to My.ViewRanger simply by tapping the "Log in with Facebook" button, it is much simpler to view on the web tracks and routes, created by your friends, over your ViewRanger premium mapping. Premium Maps from Ordnance Survey (GB), IGN (FR), OSI (Ireland), OSNI (Northern Ireland), BKG (Germany), Kadaster (NL), NRC (Canada), USGS/Accuterra (USA), LINZ (New Zealand), that you purchase for ViewRanger are also available for you to view and use online. When you view a track or route at My.ViewRanger, if you have the premium maps for that area - then the track or route will be shown over those premium maps. 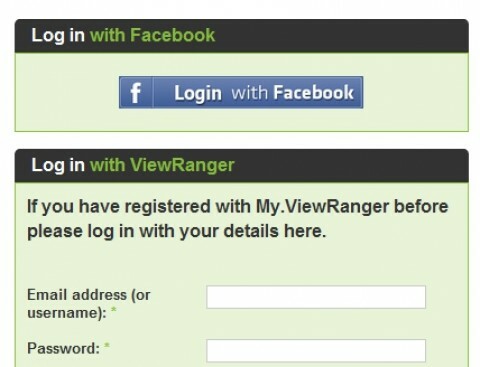 The simplicity of Facebook log-in, makes logging in to My.ViewRanger a single tap - making it easier to access your premium maps online. As ViewRanger for Facebook Timeline makes it easier to share planned trail routes, you can use it to share and plan your outdoor adventures with a group of your friends. You can share proposed trail routes via your Facebook page, giving your friends an opportunity to comment and discuss which trails you all want to do. And, of course, you can all share your ViewRanger recorded GPS tracks when the trip is complete. 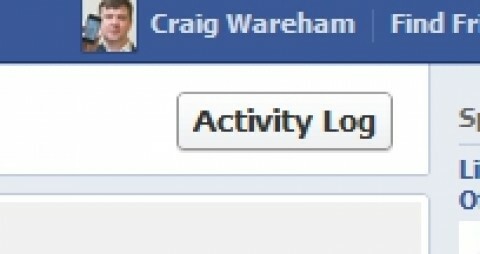 Important Privacy: ViewRanger will not post anything to your Facebook Timeline without your permission. Our aim is to allow you to more easily share your outdoor adventures with your friends on Facebook, not to spam your friends through your facebook timeline. On every Route page and Track page are the Share Buttons that let you share routes and tracks by Email, to Twitter, Facebook, or Pinterest. If you are sharing a link to a friends track or someone elses route, then clicking on the Facebook share button will continue to pop-up the standard Facebook Share dialogue. 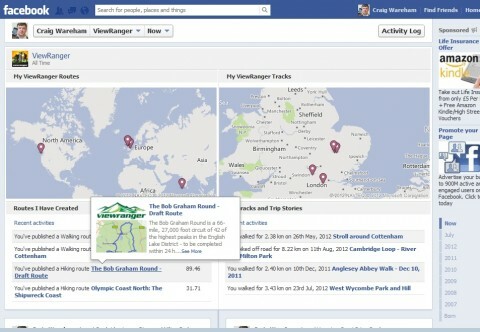 However, if you have connected ViewRanger to your Facebook timeline and click to share a route or track that you have created, then this will be frictionlessly shared to Facebook. Routes are shared as Facebook maps that may appear on your timeline. Tracks are shared as enhanced links that include information about the track (length, time, etc). Facebook has some fancy algorithms that determine whether to show an item in your activity feed or on your main timeline or not. To force a ViewRanger track or route to appear on your timeline, you need to click on the Activity Log and then select "Shown on Timeline" for the item(s) you want to force to be on your timeline. You can use the same menu to hide items from your timeline. We'll be working to extend and improve the connectivity and integration of ViewRanger with Facebook, as well as continuing to improve the social features within ViewRanger itself. Why not Like the ViewRanger Facebook page to keep up to date?